Landscapers use pine to provide year round colors and textures to properties. Pine trees aren't effortless plants requiring little to no care. These beautiful evergreen trees need care and maintenance in all growing seasons. Pines require regular watering to keep the plant healthy and to limit browning of needles. Pines offer great versatility as accent trees or foundation plants and will last for a long time in the home landscape with proper basic maintenance. 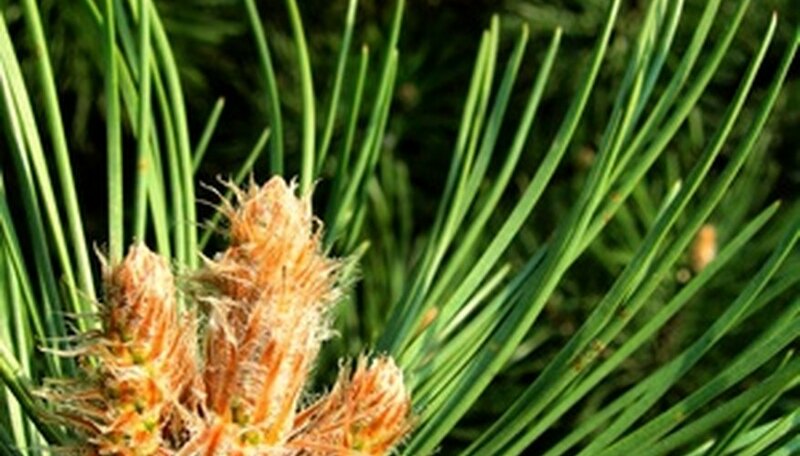 Check the health of the pine by picking off one needle from a branch. The needle should flex when bent instead of snapping in half. Examine the tree for signs of water distress such as brittle needles and browning. Locate an area under the canopy of the tree and press a long screwdriver (or water probe) into the soil. The screwdriver will stop when it reaches dry soil. Large pines require a moisture field of 18 to 20 inches deep to sustain deep taproots. Water pines regularly after planting to help establish strong roots. Pines require about 1 inch of water each week from either rain or home irrigation. Continue regular maintenance watering for the first two years of the plant's life. Arrange a circular sweat or soaker hose around the base of the tree. Line up the hose just slightly inside the edge of the tree canopy. Attach a garden hose to the end of the hose and turn on the outside water to a light flow. Allow water to seep slowly in the ground around the pine. Water slowly with a standard garden hose if a soaker hose isn’t available. Set the water pressure to a light trickle and place the hose at various locations around the base of the pine at 15-minute intervals. Test the soil with the screwdriver to determine the depth of moisture penetration 2 to 3 hours after completion of the watering cycle. Mulch greatly conserves water in the landscape and benefits pines by cooling the roots around the tree. Water pines thoroughly in the late fall before the ground freezes to sustain the plant through the winter.